DAY 16 -sent assignments to you email. DAY 15 - please check your mail for next asssignment. correct the sketch as per the feedback and submit it. now attempt mock test 1 theme sketch and submit. follow the perspective technique you have learned so far. 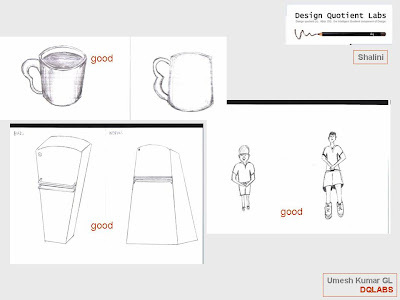 implement the feedback and draw the mentioned objects. if you have a digital camera, you can take snaps of these objects in birds eye view for thorough visualisation. 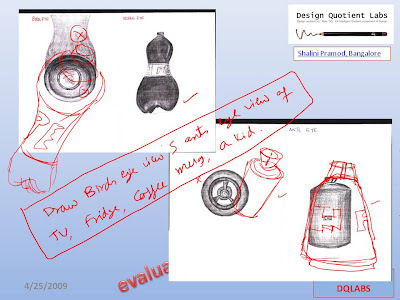 Day -10. draw a pepsi bottle, computer monitor, and a gas cylinder in ants eve view and birds eye view. DAY-9 pls submit day-8 assignments....and pending 2d composition of day 7.
take any 3 objects used in a living room and create ants eye veiw and birds eye view, based on the perspective concepts learned so far. Task 1 - create a 3d sculpture for an architecture college using sphere, pyramid , cone and cube. repeat them as many times as required. Day 5 - Create a 3d composition using a cofee mug, 2 big books and a computer mouse. submit it before 5 pm on 16th April. Day-4 implement the feedback and redo the sketch. create one more composition for the same questions. submit botht he sketches by 15th April 2009 before 5 pm. Create a 3d composition using a pyramid, a cube , sphere and a cone. assume a spotlight focussed on the objects. create shades and shadows. submit the drawing by 14th April before 5 pm. lets work on improving your skill in the following priority - 3d composition, 2d composition and theme sketching. i have sent you some 3d sample images. replicate any 2 of them and submit them by 13th April before 5 pm. How do I improve my scores on 'Neatness and Clarity'? I used oil pastels for the 2D composition, Sir. What medium would you suggest? can you use different mediums you are comfortable with and submit them to me for evaluation. lets decide which medium suits your style based on that..